Whenever I'm on the road, and I need a break from traffic, or it's too late and almost all stores and restaurants are closed, or I just want to grab a bite of their delicious hotdogs with their unique Manhattan dressing and a super cold slurpee, I go to 7-Eleven. 7-Eleven has been my all-time favorite convenience store ever since. They have a wide variety of foods to choose from all packed in a cozy convenience store. That's why when I learned that 7-Eleven was holding an eating contest, I just had to find out what it was all about. 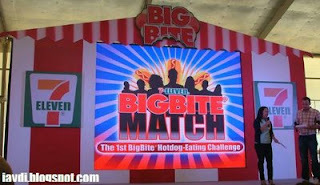 It's called the 1st BigBite Hotdog-Eating Challenge. 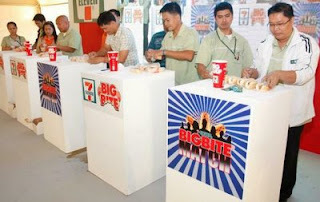 From June 26 up until August 15 2009, anyone can go to the nearest 7-Eleven store and buy the Big Bite Match Combo that contains five jumbo hotdog sandwiches of their choice and one Big Gulp all neatly packed in a kiddie-like lunch box for only P150. This serves as your official entry kit to the Big Bite Match. 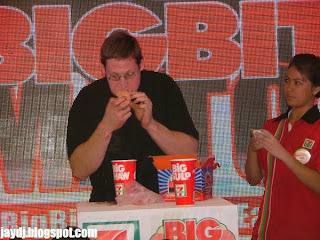 It's a clocked eating competition where a 7-Eleven representative will time you until you finish all 5 hotdogs and the big gulp. The 20 fastest times from all 7-Eleven branches nationwide will advance to the semi-finals. The twenty Semi-Finalists then compete by eating the most number of hotdog sandwiches in five minutes. The top 7 contestants move on to the finals round. The seven finalists will compete by eating the most number of hotdog sandwiches in ten minutes. And the winner gets a whopping grand prize of half a million pesos ! I have a big apetite but I eat slow. So I guess, I'll forego my chances and cheer on you guys. If you have what it takes, may be you may win the half a million pesos and be crowned the 1st Filipino hotdog-eating champion. For complete details and mechanics on how to join, visit eatingmachinesphilippines.com for more information. Do you have what it takes to down a hotdog in record time ? How bout trying it out at 7-Eleven today ! tae... gusto ko sanang sumali jan... kaso..................... di kakayanin ng panga at tyan q XD hahahahah!!! 2 minutes to eat all 5 bigbite and a big gulp.. then babayaran ko pa... lugi naman yata aq pag di ko maubus with 2 minutes.. tummy ache lang makukuha ko, minus pa laman sa wallet ko XD hahahahah! !